Now, if you know me you know I love the holidays. I adore Christmas, I adore the snow, I don't so much like the cold weather...but still; the holidays bring me so much joy. Even when I was living on the other side of the country in Vancouver, I always made it a point to be back home in Toronto for the Holidays. While living in Vancouver I had the pleasure of meeting, and befriending Tessa S, the mind behind Sweet Bake Shop. This lady is not only adorable and sweet but she is hands-down the best baker I have ever met. Years of practice and some training at the Peggy Porschen Academy in London, U.K. eventually led her to start her own boutique dessert company based in a private kitchen in Vancouver, BC. I have had the pleasure of trying so many of the tasty treats that Sweet Bake Shop creates; her cakes, cookies and cupcakes are TO-DIE-FOR! As I was browsing Sweet Bake Shop I came across a posting for Gingerbread Cookies. Not only do they LOOK delicious, but look how adorable they are with their little gold bows! Here is the recipe from Sweet Bake Shop, I can't wait to try this recipe for myself! Be sure to check out all of the other recipes on Sweet Bake Shop as well. Place the water, brown sugar, molasses, syrup, ginger, cinnamon and cloves in a medium sized pot and bring to a boil. Once boiled, remove the pot from the heat and stir in the butter with a wooden spoon. Once the butter is completely mixed in and melted, add the baking soda and mix well. Stir in the salt. Pour the mixture into the bowl of a stand mixer and allow to cool until just slightly warm. Once the mixture is cool, fit the mixer with the paddle attachment. Add the flour to the mixture, a little at a time, while mixing on low speed. Once all of the flour is combined, divide the dough into two balls, place each on a sheet of parchment paper, and flatten the dough slightly with the palm of your hand. Place another sheet of parchment paper on top and use a rolling pin to roll the dough to an even thickness (placing a non-slip silicone mat under the parchment paper keeps it from sliding all over the countertop). Once the dough is rolled, slide it (with the parchment paper) onto a large cutting board or the back of a baking sheet and chill in the fridge for 30 minutes. Chilling is so important – don’t skip this step! Preheat your oven to 400 degrees F and line a few baking sheets with parchment paper. Remove one of the rolled out doughs from the fridge and cut out gingerbread shapes. Place them on the baking sheets, spacing about 1 inch apart. Place the baking sheets with the cookies in the freezer for 20 minutes before baking. This process will ensure that your cookies don’t spread. You can re-roll the scraps of dough and repeat the chilling, cutting and then freezing/chilling process again to make more cookies. Bake for 8 – 12 minutes, until just firm to the touch. Cool completely and store in an airtight container until you’re ready to decorate. Click here and follow the steps to make easy royal icing. Once you’ve made a batch, you can start to decorate your cookies! Divide the icing into 4 small bowls. Use gel-paste food colouring to colour one bowl of icing black, one bowl red and the other a warm brown. Leave the last bowl of icing white. Fit a piping bag with a #2 tip, and spoon in some of the brown icing. Pipe a border around the entire edge of all of the gingerbread cookies. Fit a piping bag with a #2 tip and spoon in some of the black icing. Add two dots to the face to create eyes. Pipe 3 dots down the chest for buttons. Pipe little lines on the sides of the eyes for lashes. Fit a piping bag with a #1 tip and spoon in some of the red icing. Pipe a smile on the cookies. Lastly, fit a piping bag with a #1 or #2 tip (I used a #1) and pipe a bow on the head of cookies that will be girls. Add little dots along the neck for her pearl necklace. For the boys, pipe a bow-tie. Spoon a little of the left over white icing into another bowl and add water, a few drops at a time, to make “flooding” consistency royal icing. You can read all about the different consistencies of royal icing here. Pour into a squeeze bottle and fill in the boy’s bow tie and the girl’s head bow. Allow the cookies to dry for at least 2 hours before moving onto the next step. Use the paintbrush to mix a little clear alcohol (like vodka) with a bit of the gold dust, until you have a sort of “paint”. 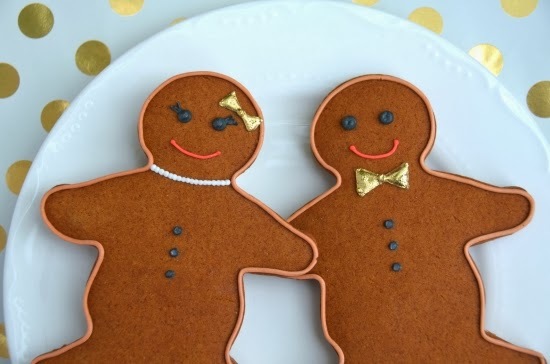 Brush over the bow tie and the head bow on each cookie. Allow to dry overnight. Package up the cookies for holiday gifts or just keep them for yourself!